The Visualization and Analytics Center for Enabling Technologies (VACET) focuses on leveraging scientific visualization and analytics software technology as an enabling technology for increasing scientific productivity and insight. Advances in computational technology have resulted in an "information big bang," which in turn has created a significant data understanding challenge. This challenge is widely acknowledged to be one of the primary bottlenecks in contemporary science. Using an organizational model such as VACET, we are well positioned to respond to the needs of a diverse set of scientific stakeholders in a coordinated fashion using a range of visualization, mathematics, statistics, computer and computational science and data management technologies. 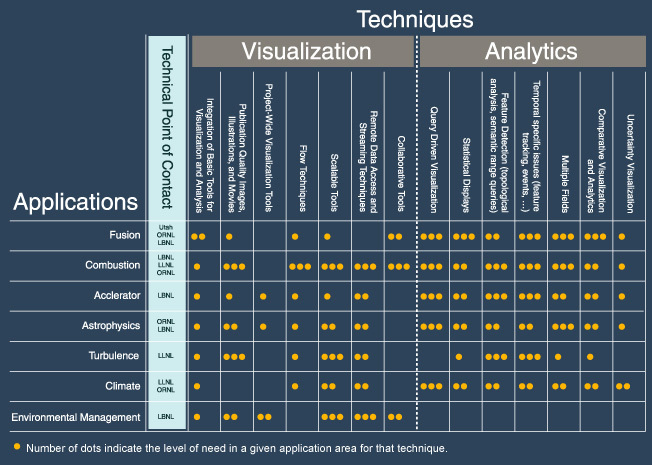 The vision of VACET is to adapt, extend, create when necessary, and deploy visual data analysis solutions that are responsive to the needs of DOE's computational and experimental scientists. Our center is engineered to be directly responsive to those needs and to deliver solutions for use in DOE's large open computing facilities. The research and development directly target data understanding problems provided by our scientific application stakeholders. VACET draws from a diverse set of visualization technology ranging from production quality applications and application frameworks to state-of-the-art algorithms for visualization, analysis, analytics, data manipulation, and data management. Our goal is to respond to the urgent needs of the scientific community by providing significant, production-quality technology to aid in data understanding.